Life is sometimes stranger than fiction. For the life of me, I can’t see why President Obama met with Mitt Romney on Thursday. 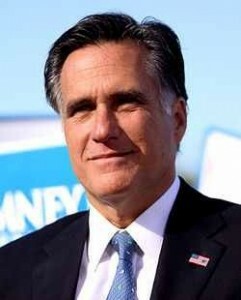 Even the Republican Party is distancing itself from Mitt Romney. Romney, even after he lost the election, continued to say that he lost because of all the gifts that President Obama gave out—referring to “free” healthcare, free contraceptives for women, forgiveness of college loan interest, amnesty for what Romney refers to as “children of illegals”—to name a few according to Romney. Although, Romney orchestrated the Massachusetts health care plan on which the Affordable Care Act is based, he distanced himself from his own plan, during the election. He previously mentioned during the campaign that 47% of the country were freeloaders and would not merit his attention, if he was elected. Thank God he was not elected. This brings me to my question of why would President Obama meet with Mitt Romney. There is very little that Romney can offer. As outsourcer and CEO of Bain industries, he closed plants and sent jobs overseas while making a whopping amount of money in the process. He showed both during the primary and general election that he had little understanding of people beyond the 1% like himself. If President Obama’s purpose was to get a better understanding of the 1%, that would be the only reason I can think of to meet with Mitt Romney. But then again, he could talk to those like Warren Buffet, Bill Gates, Oprah Winfrey and other CEO’s who are interested in helping America move forward, if he wants to gain insight on the 1%. I understand that everything is political. President Obama will earn no brownie points with those he voted for Romney, if that was the reason. And when Romney’s own party is trying to bury him alive, it doesn’t seem like he needs or merits a meeting with the president. There were no photo opportunities and the two men met privately. I can only say that I would have liked to have been a fly on the wall. The meeting was closed press and only the two men met and dined together. I cannot see any opportunities that would avail themselves in which Mr. 47% would be needed to work or discuss. This country is trying to move forward and not backwards to the 1950’s where Mr. Romney wanted to take us. We dodged the bullet on that one. Let’s just let bygones be bygones. Now hopefully, Mitt Romney will ride away in the sun on his horse like in an old western movie. Debbie Hines is a former prosecutor and founder of LegalSpeaks, a progressive blog on women and race in law and politics. As a legal and political commentator she has appeared in national, international and local media including the Michael Eric Dyson Show, local NBC, ABC and CBS affiliates, RT TV, CBC- Canadian TV, NPR, XM Sirius radio, the Baltimore Sun, Washington Post and Washington Times among others. She also contributes articles to the Huffington Post and the Women’s Media Center. The election is over but the Republicans’ war on voting rights is far from over. 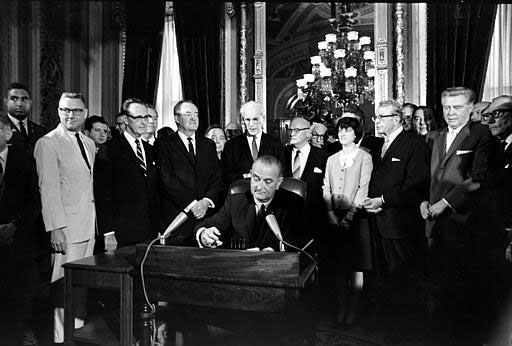 Alabama is now going after the heart of voter rights, section 5 of the 1965 Voter Rights Act. Just three days after the election, the Supreme Court agreed to take on an Alabama case on whether section 5 of the Voter Rights Act should still apply to states today. The nine states of Alabama, Alaska, Arizona, Georgia, Louisiana, Mississippi, South Carolina, Texas and Virginia and municipalities and counties in seven other states, must seek federal approval before changing their voting laws, due to their past history of racial discrimination. Shelby County, Alabama sought to change its voting laws without the approval of the Justice Department. Opponents of section 5 state that the “evils it was crafted to address have been long over”. If the 2012 election taught us anything, it is that these protections under the Voter Rights Act in these southern states and other municipalities are still needed. During the past election, Texas and South Carolina attempted to make changes to its voter laws by using photo voter ID laws. In Texas, the Justice Department denied approval and the U.S. District Court for the District of Columbia agreed due to its discriminatory effect on minorities. In the South Carolina case, the U.S. District Court for the District of D.C. approved the new law for future elections. However, Judges John Bates and Colleen Kollar- Kotelly concurred with the need for section 5 stating, “One cannot doubt the vital function that Section 5 of the Voting Rights Act played here. Without the review process under the Voting Rights Act, South Carolina’s voter photo ID law certainly would have been more restrictive.” And for Rep. John Lewis (D. GA) who fought for civil and voting rights for blacks in the 1960’s said that 2012 voter ID laws are reminiscent of the past evils. In 2006, former President George W. Bush signed a bill extending the 1965 Voter Rights Act for an additional 25 years due to the continued need for it. Republicans had a systemic plan known as Voter ID laws to disenfranchise many minorities, college students and young adults and deny them the right to vote in the 2012 election. Despite virtually no evidence of in person voter fraud, 37 states passed voter ID laws requiring some type of ID and other onerous conditions. The plan backfired and resulted in driving millions of those voters to the polls to vote for President Obama. New battles must be fought to prevent these suppression practices from continuing and occurring in the next election—2014. The GOP new voter laws caused confusing ID problems, end of early voting days, long lines of over 30 minutes to up to 7 hour in many minority neighborhoods as compared to less times in white precincts, purging of eligible voters, voter intimidation and a poll tax in many cases In 2012 long lines were an understatement in many parts of the country. We cannot incorrectly conclude that the system worked because of the large turnout of the affected groups. Far from it, the system failed. And changing it to make voting accessible for every eligible citizen must become a high priority before the next election. Many minority voters, young adults and college students were still unable to vote, voted provisionally, stood in long lines or had to miss work all day and had to pay the equivalent of a poll tax to exercise their right to vote. For those persons who think the election issues are over—think again. 2014 will be here in no time. There is also the issue of those citizens, young and old who were not able to comply with the new voter ID laws, effectively denying them the right to vote and cast a ballot. And many laws that were not able to go into effect for the 2012 election, will be in effect for 2014 and beyond. The right to vote is the hallmark of democracy. It means everything in a democratic society. And we must continue to fight to ensure that every voter votes and every vote counts. The Supreme Court will hear the Shelby County, Alabama case this term. Arguments will probably be heard in the spring. Washington, DC based Debbie Hines is a former prosecutor and founder of LegalSpeaks, a progressive blog on women and race in law and politics. As a legal and political commentator she has appeared in national, international and local media including the Michael Eric Dyson Show, local NBC, ABC and CBS affiliates, RT TV, CBC- Canadian TV, NPR, XM Sirius radio, the Baltimore Sun, Washington Post and Washington Times among others. She also contributes articles to the Huffington Post and the Women’s Media Center. In the middle of America’s bloody Civil War, President Abraham Lincoln made the fourth Thursday in November a day of thanksgiving on October 3, 1863. A day of thanksgiving had been established as far back as President George Washington but Lincoln made it a regular holiday for Americans. We have not had a bloody civil war but we have come out of a very contentious election; Hurricane Sandy has wrecked many livse—many are still without food or electricity. We still need to set aside Thanksgiving as a day to give thanks for what we have and what we have in each other. There is always much to be thankful for and to pray for those in need. Let’s not forget that every day is a day of Thanksgiving. I give thanks for being in a country where we can give voice to our political viewpoints. I have regularly for the past several years blogged, wrote articles and appeared on TV and radio expressing my political and legal commentary. And I am thankful that we live in a country that allows voices to be heard and not silenced. President Obama visited Burma this past week and met with Aung San Suu Kyi, a Nobel Peace laureate who up until 2010 was imprisoned in her house for 15 years for being a Democrat activist and expressing her views. This year let’s be thankful for having a voice and living in a country where we are free to express our political views. Hopefully, my voice will on occasion move someone to take action. This article first appeared in Lawyers.Com for which I was interviewed on the denial of the gag order. The email, sent the week before the trial judge was to rule on whether a gag order should be placed on O’Mara, was an attempt to help the defense find any and all statements he’d made in the media. And it could have looked like an admission that he had been improperly vocal about Zimmerman’s case. But instead of denying or ignoring what could have been a total nightmare for the defense, O’Mara posted the email on his George Zimmerman Legal Case web site and spun it in his favor. “We’re confident that everything we’ve posted, and everything we’ve said publicly is proper and well within our rights, but we know that on Friday, the State is likely to find the most questionable thing Mark’s said and present it to the Court,” says O’Mara on the site. It worked: Judge Deborah Nelson ruled on Oct. 29 that a gag order against O’Mara is not necessary. It was the second time the state failed to silence the defense lawyer: On May 1, the former trial judge in the case, Kenneth Lester, declined to impose a gag order. Zimmerman and O’Mara went on to be interviewed on Fox News by Sean Hannity, and O’Mara and Zimmerman both continued to post updates about the case on the Internet. “The fact that the judge did not order a gag order means the Florida judges do not think the information disseminated to social media network outlets will prejudice the case or selecting the jurors,” observes Debbie Hines, a Washington, D.C., trial lawyer and former prosecutor. Social media has given defense lawyers a whole new way to try to sway public opinion in their clients’ favor — all in the hopes that when it comes time to select a jury, potential jurors will have had a good look at the defense’s side of things. Zimmerman’s lawyer announced a new strategy following his win on the gag order. Some of the responses to his request for gentle readers to send in what they thought were improper uses of media indicated that his selective publication of public documents in the case amounts to “effectively editorializing with our decision of omission or inclusion,” says O’Mara in a Nov. 13 posting. “From now on, we will post ALL public documents associated with the Zimmerman case, including motions filed by the defense and the State, as well as orders filed by the Court,” O’Mara says. He adds that he defense team “will continue to maintain the previously guarded privacy of certain witnesses, and will not post the names of witnesses being deposed unless their names have been previously disclosed by the State,” some of which include police and witnesses who have voluntarily disclosed their identity to the media. This new policy is another canny move — a likely dig at the state, which made a rather public stumble on Nov. 8, when lead prosecutor Bernie de la Rionda leaked a list of the names of witnesses, violating a court order to keep them secret. The Trayvon Martin case is not expected to go to trial until June, 2013. The trial could be finished online before it starts in the courtroom if the defense has its way. Criminal defense attorney, Mark O’Mara has been vigorously defending his client in the media, particularly online through social media. The defense has put court pleadings in the web site dedicated for the defendant’s case, commented on the evidence and witnesses just in case any would be jurors need to read them. The Zimmerman defense has a Twitter account, web site and had a Facebook account dedicated to the case. One may wonder why the defense would go to such lengths to publicly try to present its case to the online community. 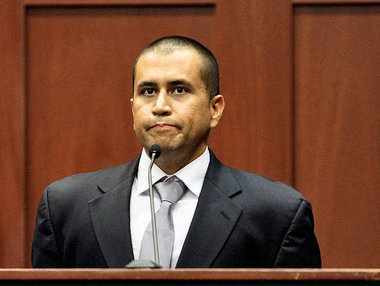 Previously, the defendant, George Zimmerman conducted an on air interview. Now his attorney conducts interviews and conducts public relations through online accounts concerning the case. Anything that the defendant says either in court or publicly can and will be held against him. A Facebook or online forum generated by the defendant’s attorney does not have the same problem. The purpose that the defense is trying to attain is to get sympathetic jurors towards its case. Defense attorney O’Mara says he uses the online and interviews to counter the negative publicity against his client. Whether it’s a shrewd practice or a stupid one remains to be seen. Speaking of online social media, the defense requested the Facebook page of Trayvon Martin in a possible attempt to see if there is any evidence to portray him as a violent teenager. That strategy may ultimately backfire. Trayvon Martin was coming from the store with a bag of Skittles and iced tea when he was profiled, followed and shot by George Zimmerman. Attempts to cast Trayvon Martin in a negative light may backfire against the defendant since George Zimmerman was the one disobeying instructions given by the 911 call center. Trayvon Martin was walking back to his father’s home in a gated neighborhood where he had a right to feel safe. This week, the defense intends to start deposing the first responders to the scene of the crime. It will be interesting to see if Judge Nelson will allow the defense to comment on and post online the deposition transcript or excerpts of the deposition of any witnesses. That would be going too far in my opinion. The defense says it does not intend to identify witnesses that are deposed. 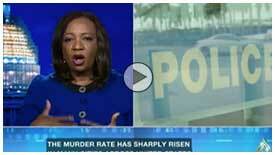 Those who support Trayvon Martin’s family have always wondered if a fair trial could be held. If the judge does not bar the defense from commenting online about any witnesses’ deposition testimony, should they attempt to do so, it will amount to the case being tried online before its start date of June 13, 2013. And if that happens, a trial could be over before it even starts—at least in the minds of the jurors. Of course, that’s what the defense is aiming to do. President Obama won the 2012 presidential election despite an army of new GOP voter ID laws, suppression and intimidation tactics to deny the vote to many citizens, including minorities, young adults and seniors. 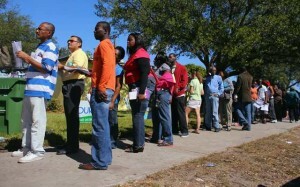 The after effects of the voter ID laws and voter suppression tactics are still going on. Many minority voters, young adults and seniors were still unable to vote, voted provisionally, stood in long lines or had to pay the equivalent of a poll tax to exercise their right to vote. Adding insult to injury, many voters after standing in long waiting lines ended up voting provisional ballots—many of which may not count. In Ohio, there are still 207,000 provisional ballots which won’t begin to be counted until November 17. That’s an insane number of provisional ballots. In Philadelphia, 27, 000 people voted by provisional ballot, almost double the number that did in 2008. A provisional ballot is cast in instances where problems arise such as where the voter is not on the poll books as a registered voter, has incorrect ID or other issue. They must vote via paper ballot that is placed in an envelope and not counted unless the problem is solved. Republicans, since the 2008 election of President Obama, tried every ill- conceived tactic to prevent minorities, young adult and many senior citizens from voting in significant numbers. Those efforts backfired. Despite the GOP tactics, African Americans, Hispanics, Asian Americans and young adults came out in larger percentages than in the 2008 election. That does not mean the war on voter rights is over. Court battles are still waging against some of these new voter laws. Some states’ laws while not in effect for 2012 may be in effect for the next election in 2014. Wisconsin and Pennsylvania voter ID laws were not in play for the 2012 election. The Supreme Court has agreed to take on an Alabama case on whether the Voter Rights Act should still apply. The states of Alabama, Alaska, Arizona, Georgia, Louisiana, Mississippi, South Carolina, Texas and Virginia must seek federal approval before changing their voting laws. If anything the 2012 election taught us, the protections in the southern states under the Voter Rights Act are still needed. And new battles need to be fought to prevent these suppression practices from continuing and occurring in the next election—2014. The GOP new voter laws caused confusing ID problems, end of early voting days, long lines of over 30 minutes to up to 7 hours in minority neighborhoods as compared to less times in white precincts, purging of eligible voters, voter intimidation and a poll tax in many cases. As Ben Jealous, President of the NAACP stated having to take off from work and then stand in a line to vote for 8 hours amounts to a poll tax. During early voting in Florida, for example, polls closed on early voting at 7 p.m. but the last voter voted after 1:00 a.m. on the Saturday before the election. Florida’s Governor Rick Scott disallowed early voting on Sunday before the election. In the past, the Sunday before the election was a major GOTV day for blacks. In 2012 long lines were an understatement in parts of Florida. Many voters after standing in long waiting lines ended up voting provisional ballots—which may not be counted. All of these problems caused by the new voter ID laws in states were unnecessary as study after study proved there was no in person voter fraud. We do not need to come to the wrong conclusion that the system worked because of the large turnout of the affected groups. Far from it, the system failed. And changing it to make voting accessible for every eligible citizen must become a high priority before the next election. For those persons who think the election issues are over—think again. 2014 will be here in no time. There is also the issue of those citizens, young and old who were not able to comply with the voter ID laws, effectively denying them the right to vote and cast a ballot. The fact that the election is over is not a reason to go back to sleep for 4 more years. It’s a time to stay active and become engaged, if you want change in this country. Now that the 2012 election has shown minorities and women flex their muscle, they need to continue flexing it. It will take a collective effort to bring about voting changes. Solutions are needed. Coalitions such as the Lawyers Committee for Civil Rights Under the Law, the Advancement Project, NAACP, Color of Change, Voto Latino and La Raza must continue to fight these laws along with the Department of Justice. The right to vote is the hallmark of democracy. It means everything in a democratic society. Non-partisan armies of lawyers were available on election day to protect the right to vote. We dodged a bullet for 2012. The voter ID gun is still loaded and aimed at minorities, young adults and seniors. It is loaded, aimed and set to fire again in 2014, unless we continue to fight these suppressive practices. Stay tuned–Part II will cover some solutions. 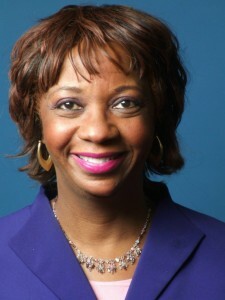 Debbie Hines is founder of LegalSpeaks, a progressive blog on women and race in law and politics. As a legal and political commentator she has appeared in national, international and local media including the Michael Eric Dyson Show, local NBC, ABC and CBS affiliates, RT TV, CBC- Canadian TV, NPR, XM Sirius radio, the Baltimore Sun, Washington Post and Washington Times among others. She also contributes articles to the Huffington Post and the Women’s Media Center.